Pakistan’s Khushab Plutonium Production Complex, located 125 miles south of Islamabad, is dedicated to the production of plutonium for nuclear weapons. Its expansion appears to be part of an effort to increase the production of weapons-grade plutonium, allowing Pakistan to build a larger number of miniaturized plutonium-based nuclear weapons that can complement its existing highly enriched uranium nuclear weapons. Originally, the site consisted of a heavy water production plant and an estimated 50 megawatt-thermal (MWth) heavy water reactor, both of which became operational in the 1990s. However, Pakistan initiated the construction of a second heavy water reactor between the year 2000 and 2002, a third one in 2006, and a fourth one in 2011. Kindly Note: Khushab Nuclear Complex, like that at Kahuta, is not subject to International Atomic Energy Agency inspections. The recent imagery shows that two previously unseen types of activity are taking place at the site. First, vegetation has been eliminated in a large central area between reactor 1 (see figure 1) and reactors 2 and 3 (see figure 2). It is difficult to establish whether this desertification is intentional or not. If intentional, it could potentially signify that Pakistan is preparing the grounds for future construction activities. Second, both December 2014 and January 2015 images show that some new construction activity is taking place in the south-west corner of the Khushab site, south of reactors 2, 3, and 4 (see figure 4). It is not yet clear what this activity is. One possibility that cannot be ruled out is that this activity could be for the construction of another reactor. A comparative analysis of the construction activities for reactors 2, 3, and 4 highlights several similarities. First of all, the new construction area is located close to Khushab’s heavy water production plant. Second, the area is surrounded by a security perimeter that is, in shape and size (see figure 3, 1 km by 1 km), very similar to the perimeter surrounding reactors 2, 3, and 4. Third, the foundations that are visible within this security perimeter are, in shape and size, very similar to the foundation work that was done for the construction of reactor 4. However, analysis of this new image also highlights a feature that is not consistent with the construction of a reactor similar to reactors 2, 3, and 4. The foundations are not located precisely in the center of the security perimeter, rather more toward the south end of it, closer to the river. On balance, it is too early to make a definitive assessment on what this construction is meant for. The Khushab facility is characterized by a rather profound vegetation anomaly, that is visible even in the low resolution browse chips of medium resolution imagery from SPOT and LANDSAT-7. This vegetation anomaly is the result of differential grazing, a product of the security perimeter around the facility. Khushab 1, a derivative of CIRUS reactor, was commissioned in March 1996 and had gone critical and began production in early 1998. It is a 50 MWt Heavy water and natural uranium research reactor for production of plutonium and tritium. The construction of Khushab-2 started in 2001 and was completed in 2009. It went in to critical phase in 2010.It is a 50 MWt Heavy water reactor producing 11-15 kilogram of plutonium and tritium a year for the Pakistan's nuclear weapons programme. 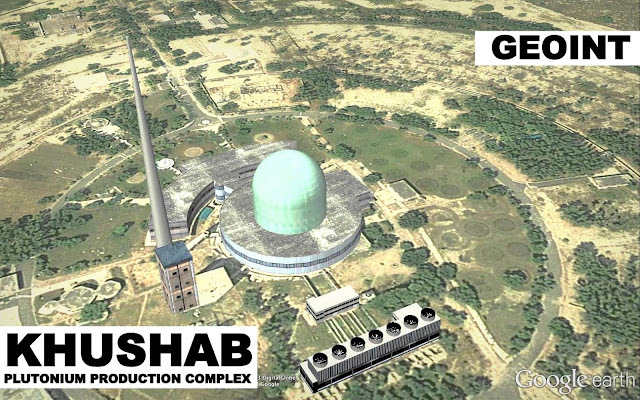 The construction of Khushab 3 started in 2006 and was completed in 2010 and it went in production in October 2013. It is a 50 MWt Heavy water reactor producing 11-15 kilogram of plutonium and tritium a year for the aforesaid program. The construction of Khushab-4 started in 2011. By 2012, the construction was roughly 50 percent finished and by end of 2014 overall construction was completed. This reactor site allegedly generates plutonium for tactical nuclear warheads. From satellite imagery, the overall structure appears to be different from earlier reactors. In 1996 China Nuclear Energy Industry Corporation sold a special industrial furnace and high-tech diagnostic equipment. It was subsequently reported that the equipment was intended for the Khushab facility. High temperature furnaces are used to mold uranium or plutonium. On top of that Pakistan succeeded in illicitly acquiring a tritium purification and storage plant, and tritium precursor materials from two German firms through AQ Khan clandestine network. The United States apparently obtained a commitment from China not to supply the heavy water necessary to start up this un-safeguarded plutonium production reactor. But in March 1998 it was reported that China had eventually supplied Pakistan with far more heavy water than needed to operate the safeguarded KANUPP nuclear power reactor, suggesting that Pakistan would be able to divert heavy water from the civilian plant to the Khushab Nuclear Complex. PAF Base Musaf a.k.a Sargodha Air Base, located west of Lahore, hosts the Headquarters of the Central Air Command, one of three combatant air commands on the Pakistani Air Force. Aircraft currently based at this facility include two squadrons of General Dynamics F-16A fighters. The base is also the site of the Pakistan Air Force Combat Commander School. The distance from the base to Khushab Complex is just 29.2 miles/47.1 Km by Air and to Central Ammunition Depot, Kirana Hills is 6.9 miles/ 12 Km by Air. Central Ammunition Depot, Kirana Hills (Proximity Distance - 31 miles/50 Km by Air from Khushab Complex) near Sargodha holds a vast inventory of China supplied M-11 missiles, (an export version of DF-11) which are rechristened as Shaahen I (Range: 750 Km) and Shaheen II (Range : 100-300 Km) by the Pakistanis. The Shaheens are land-based supersonic surface-to-surface medium-range guided ballistic missile with a suitable delivery mechanism for a conventional high-explosive warhead or a nuclear warhead. Pakistani military has constructed storage sheds for these missiles and for their Transporter Erector Launchers (TEL), as well as related maintenance facilities and housing for launch crews. Reportedly soldiers have also been sighted practicing simulated launches with advice from visiting Chinese experts. At the time of crisis the M-11/ Shaheen missiles could be deployed at Gujranwala, Okara, Multan, Jhang and Dera Nawab Shah, where defence communication terminals have been already set-up. Khushab Complex is the heart of Pakistan's nuclear weapons program and major feeder to over all deterrence and readiness of the nation. The presence of high density air defense systems within the complex and close proximity to PAF Mushaf Base and Central Ammunition Depot proves its vital importance within the network.